When I heard about this movie I was interested. Then the trailer came out and I got very excited. Then it was finally released in theaters and I heard that it was just OK—that there weren’t a lot of funny parts. I got disappointed and before I realized it, it was out of theaters. Today I sat down with trepidation and watched the DVD. I don’t know if it is because I wasn’t expecting much or because I enjoyed the books so much, but I was pleasantly surprised. Very much so. The people who made this movie did a very good job getting the spirit of the book. It’s silly, through and through. It takes potshots at human nature, religion, bureaucracy, science fiction movies, you name it. I guess what people didn’t like is that the silliness is sometimes subtle—and occasionally it’s completely over the top. Its path goes through straight up visual gags to subtle, wry digs at various things. I suppose that could feel unbalanced, but I actually thought it was a pretty good combination. The characters are well acted. Zaphod was completely loony the entire time and Arthur seems like he’s been forced into every single situation against his will (he has, really). Trillian and Ford are great too. There’s also a narrator, who narrates the Hitchhikers’s Guide entries, as well as parts of the movie. He’s got a english accent which suits the dry humor perfectly. I especially liked the Vogons, who I think were done by Jim Henson’s company. Kudos to the film-makers for making their crazy body shape and then actually showing them walking around on those stubby legs. This strikes me as a movie that gets better every time you watch it. I’ve only seen it once, so that’s really just a hunch. 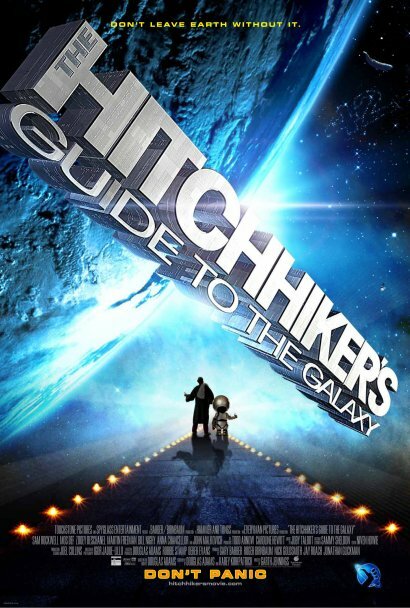 This movie should appeal to you if you’ve read the Hitchhiker books. If you havent, picture a short interlude in which a nuclear missile improbably changes into a sperm whale which promply falls from 60,000 feet while discovering and exploring its own consiousness before finally smashing violently into ground. If that makes you smile then you’ll probably like this movie. I sure did. And I still think digital watches are a pretty neat idea.